Adventures to unexplored lands, crossing ferocious seas, battling snowstorms, escaping death – the Endeavour expedition to the Antarctic in 1914 should be a thrilling story to tell. 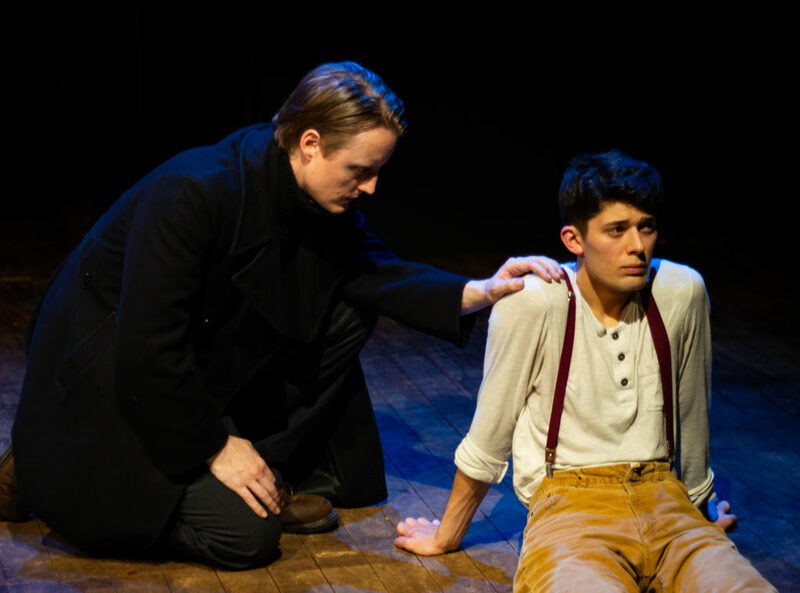 However, Stolen Elephant Theatre’s current production, Shackleton and His Stowaway loses any possible edge-of your-seat moments, providing a colourless and bland take on the heroic tale. Setting off from Buenos Aires, revered explorer Ernest Shackleton is ready to lead his new expedition through the Antarctic on the apt-named ship the Endeavour. Soon after casting off, an eighteen year old Welsh stowaway is found hiding within the bows. Shackleton takes a shining to the lad and before long drums up a friendship between them. However, the stowaway’s admiration for the great explorer begins to dissolve as Shackleton’s poor judgement call leads to the Endeavour being trapped in the polar ice pack, eventually breaking up and sinking. Stranded in unimaginable freezing temperatures, the newly formed friendship is put under strain as the need to survive takes precedence. The biggest let down of the production is the writing, which feels as lost in the wilderness as its subject matter. Often stagnant, it lacks much action – most of the exciting parts of the expedition being described in past tense by the characters, rather than actually performed. The modern, colloquial language jars with its 1914-1916 time period, often making you question the play’s believability. Much doubt is also thrown at the authenticity of Shackleton and the stowaway’s relationship that seems far too friendly and on a level footing, status-wise. By them being too pally too soon, writer Andy Dickinson gets stuck in the mud, not being able to display a progression in the characters’ friendship, with the play finishing on a rather flaccid note. With their best efforts, actors Edward Cartwright (Shackleton) and Tom Taplin (The Stowaway) try to flesh out their characters as best they can. You certainly cannot fault their determination in trying to squeeze something juicy out of the otherwise lacklustre script. Taplin’s happy-go-lucky, wise cracking stowaway is the most compelling to watch, however, this is most likely helped by the fact that Taplin lucked out on having the better written character. Cartwright struggles through with the two-dimensional Shackleton, but ultimately is defeated by the shortcomings of the writing. An element that did help to lift the production was director Enrique Muñoz’s use of visual effects, adding projections onto the walls and stage floor during transitional scenes. Maps of the colossal journey through the Antarctic, as well as photographs from the actual expedition, offer proof in how courageous all the men were. Shackleton and His Stowaway has so much potential, but sadly, in many ways, is left adrift. The actors try to salvage what they can, but with some poor directional choices and the fundamental script being far from engaging enough, they are on a sinking ship (no pun intended). This epic tale becomes quite the epic fail. This is the story of a marriage lived in rural Spain from the perspective of the titular Yerma, whose name translates as ‘barren’, a woman who desperately wants a son. Written by Federico Lorca in 1934, Cervantes Theatre have stuck somewhat to the original text whereas a recent, much praised Young Vic production was a modernised imagining. Whilst I didn’t manage to see either of the two London runs, it wasn’t for lack of trying. It was therefore with high expectations I went into this performance. The actors can hardly be faulted. 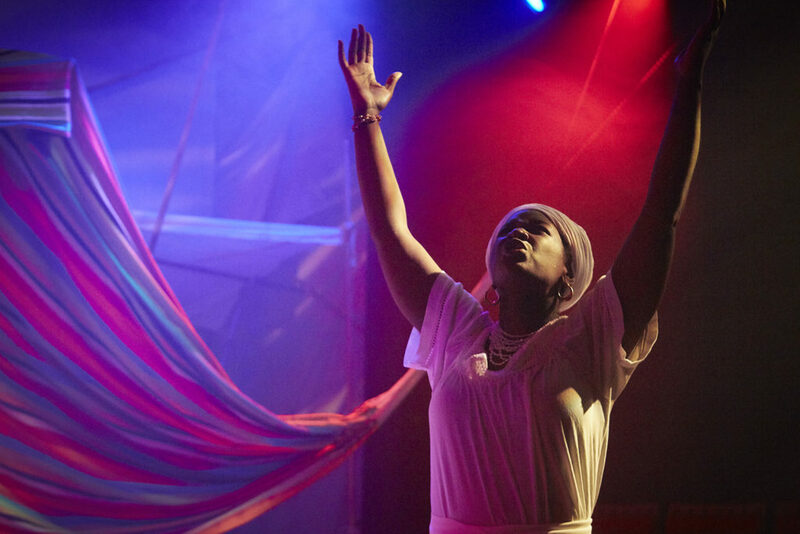 Leila Damilola as Yerma clearly puts her all into the role, so much so that during the bows she had to be supported to stand due to the severity of her sobbing from the final scene. Tom Whitelock as Juan strikes the balance between being both the subject and object of suffering whilst Coco Mbassi brings much needed light humour to this otherwise intensely unhappy tale. The whole cast is good, even if some of the characters appear somewhat superfluous. Unfortunately, the text has not aged well, with the abundance of watery, fertility metaphors and various descriptions of breasts as mountains or as sand, sounding jarring to a modern ear. Jorge de Juan’s direction felt clumsy and heavy-handed. The passage of time could have been made easier to follow, with no signal other than the explicit mention of the length of Yerma’s marriage. There were other choices as well which felt odd and made the story confusing. I lost patience entirely though in the final act when Yerma visits a local mystic to bring her a child, and the village women become possessed. It was too loud. Too manic. Too long. There is a limit to how much I can cope with convulsing and chanting before I itch to leave. If I was being kind I would say that it was the intimacy of the studio space that made the climactic scene so uncomfortable. Perhaps if I had been further away from the noise and the action I wouldn’t have found it so painful. The goal of Cervantes Theatre, to perform great Spanish Theatre in the heart of London, is admirable. I am a strong proponent for performing work written in other languages on the London stage. We should indulge in foreign cultures more than ever, especially given the current climate of impending withdrawal from the EU. I just wish that this had been a better executed example.